Experience a decidedly dark and daring comedy that takes hilarious aim at today’s absurd and dangerous world. 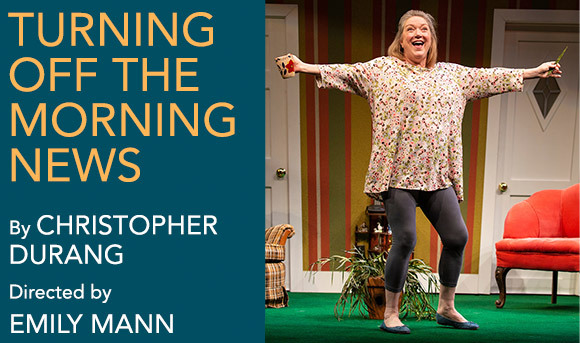 Tony Award®-winning Christopher Durang is back with a new cast of eccentric characters—starting with Cliff and Salena, whose across-the-street neighbors are at best peculiar—and at worst, stark raving mad. Turning Off the Morning News may simultaneously unnerve you and delight you. It will keep you in suspense, hysterics, and undoubtedly, in conversation, long after you leave the theater. This play contains mature themes and potentially disturbing content, including references to gun violence and domestic abuse, sound effects of gunfire and prop guns onstage. If you have questions or require additional information, please call the Ticket Office at 609.258.2787 or email sales@mccarter.org.